For individuals or married couples actively engaged in farming and/or ranching, with the majority of income coming from production agriculture. The Achievement Award acknowledges success in agricultural production and leadership achievement. Competitors are judged on the growth and financial progress of their farm or ranch, as well as their Farm Bureau and community leadership. A NEW FORD PICKUP TRUCK & More! *Winner will receive $33,750 to apply to the purchase of the Ford truck of his/her choice. The top three scoring written applications will be named state finalists and will host a panel of judges with an interview and tour of their farm operation. Each finalist receives a $1,000 cash prize and a one-night stay at the the SCFB Annual Convention in Myrtle Beach, SC in December 2019 and at the SCFB YF&R Conference in Charleston, SC (Saturday, February 8, 2020). Applications will be available in July. 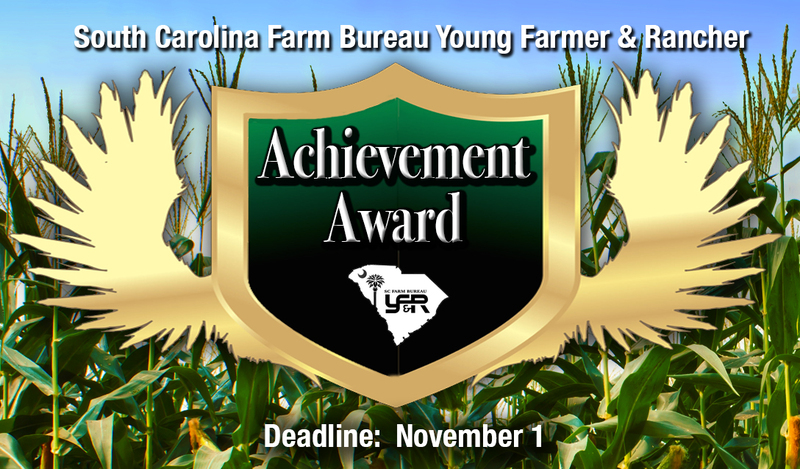 Achievement Award prizes are sponsored in part by the SC Farm Bureau Federation and Southern Farm Bureau Casualty Insurance Company.